Oxford is a beautiful city in central southern England described by the medieval poet, Matthew Arnold, as 'The City of Dreaming Spires'. That description still applies to the place which is now best known as the scene of many murders, all of which have been solved by either Inspectors Morse or Lewis. As an aside, it has also been made incredibly famous by its illustrious university which was first established in the 12th century. 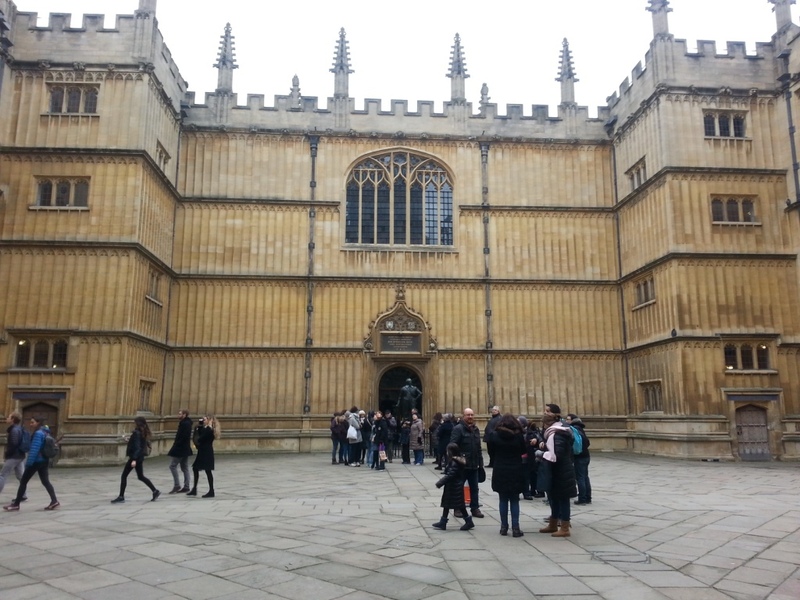 Today, Oxford is a bustling and vibrant city filled with young people and tourists who join together to clog up the delightfully narrow streets and malls. With a dread for driving in unfamiliar streets heaving with people trying to go about their business I decided to use the Park and Ride facility found in most large English centres. 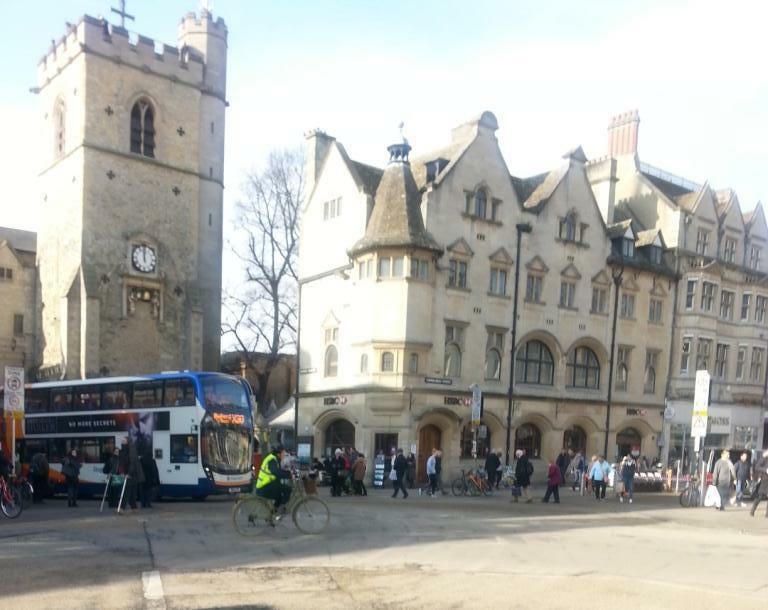 The Oxford Park and Ride is the easiest means of travel into Oxford city. There are five park and ride sites around Oxford's ring road where regular bus services will provide a stress-free trip to the city centre. At a Park and Ride once you find a parking spot you need to purchase a parking ticket for £2 and that entitles you to park there all day. Once you've done that, catch the bus, pay your return fare if £2.60 then sit back, relax and enjoy the trip into the city centre on an eye-catching, purple double-decker bus. I had planned out my day so that I would walk to the various sights I wanted to take in, so I alighted from the bus in Speedwell Street and set off on my trek. It was my intention to see as many museums as I could because entry to all the museums is FREE. 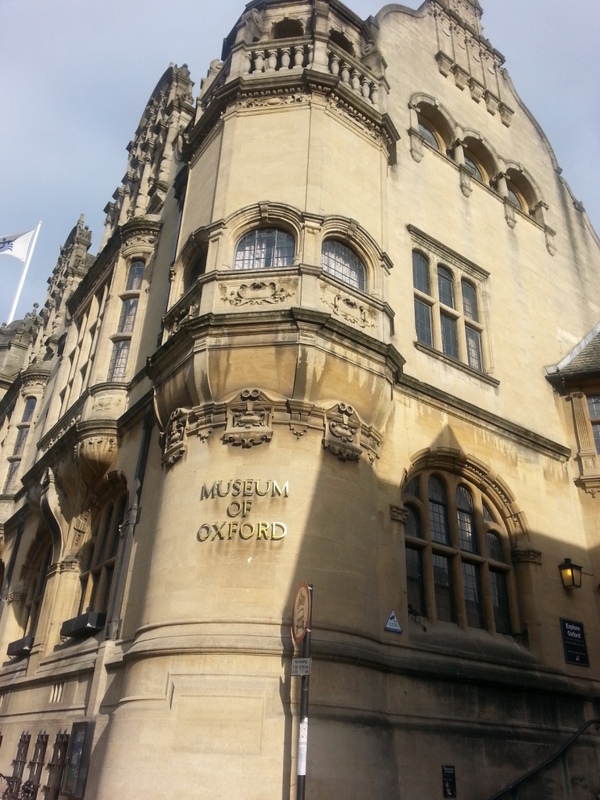 The Museum of Oxford was just up St Aldate's and that was my first stop. I had approached the building thinking it was all the museum based on the size of the sign on the outside of the building. However, it occupies two rooms on the ground floor and the rest of the building is the Town Hall. 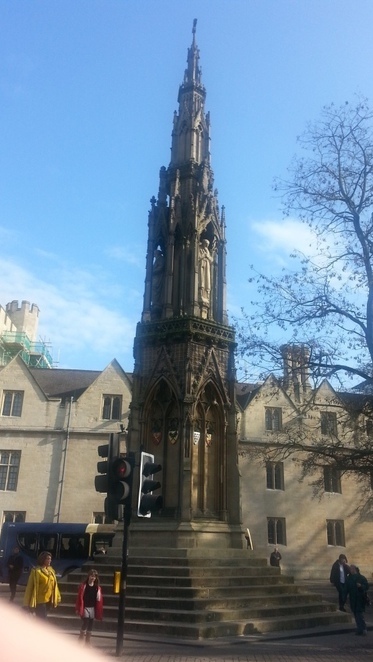 After about 15 minutes in the museum I sauntered off up to where St Aldate's becomes Cornmarket Street. 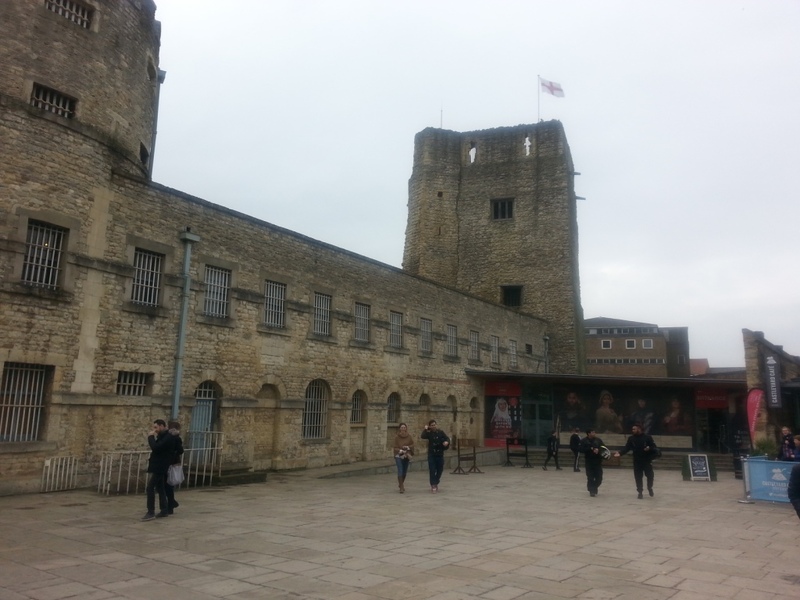 I stopped at the Carfax Tower as I was lucky enough to be there when it struck 12 midday. I didn't go in but you can climb the tower if you're young, fit and athletic — everything which I am not — and it is said you get a very lovely view of the whole city. Are those other buildings really leaning over? After my ears stopped ringing I walked along Cornmarket Street to the Martyrs' Memorial. Although it just stands on the street it does hold a lot of history in its stonework. It's worth a read. 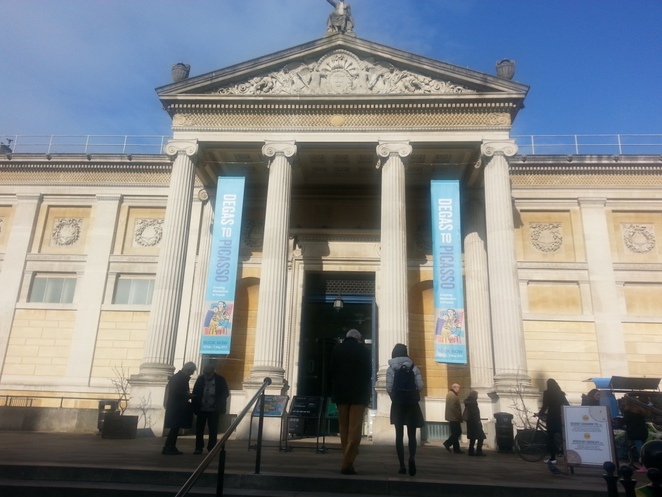 Turning into Beaumont Street I headed for the Ashmolean Museum. This is huge and covers six floors, including the restaurant. An impressive collection of all aspects of human history. This isn't just about England, there are ancient Greek, Roman and Egyptian artefacts, too — a real delight for history buffs. 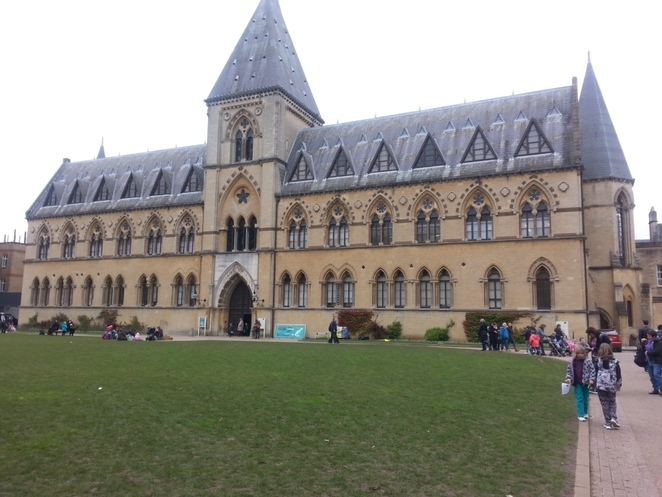 Next I crossed over a couple of streets and headed for the Oxford University Museum of Natural History and the Pitt Rivers Museum on Parks Road. Here you get two for the rice of one (That's just an expression as it's all FREE anyway). I entered from Parks Road into the Museum of Natural History. The exhibits range from old to new, the whole setup maintained my interest as I circumnavigated the hall. 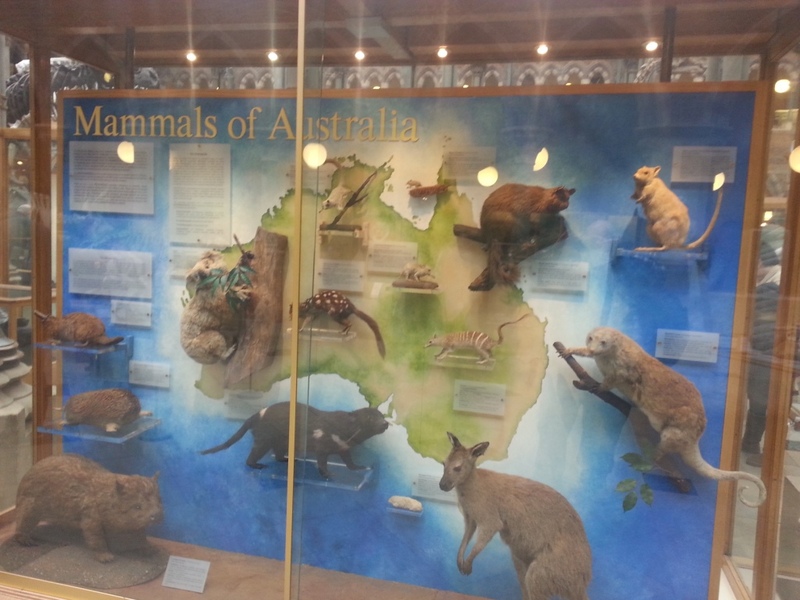 There was even a display of our very own Australian marsupials. Entry to the Pitt Rivers Museum is at the back of the Natural History Museum. In my own humble opinion nothing compares with the Pitt Rivers. This is a real Victorian showpiece and you really do step back in time. It reeks of history. The museum was founded in 1884 when General Augustus Pitt Rivers donated his collection to the University. 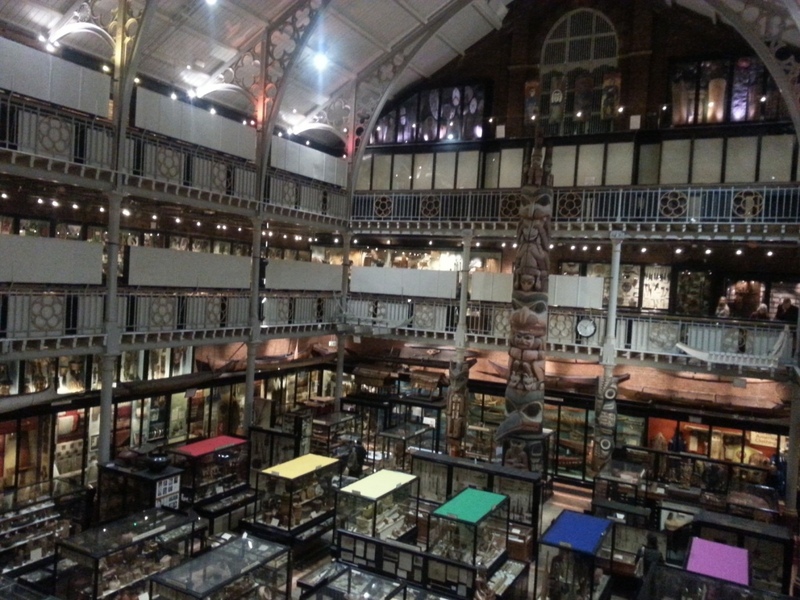 The Pitt Rivers was the place in which I spent the longest time. When I managed to drag myself out of the Pitt Rivers my next stop was the Sheldonian Theatre. 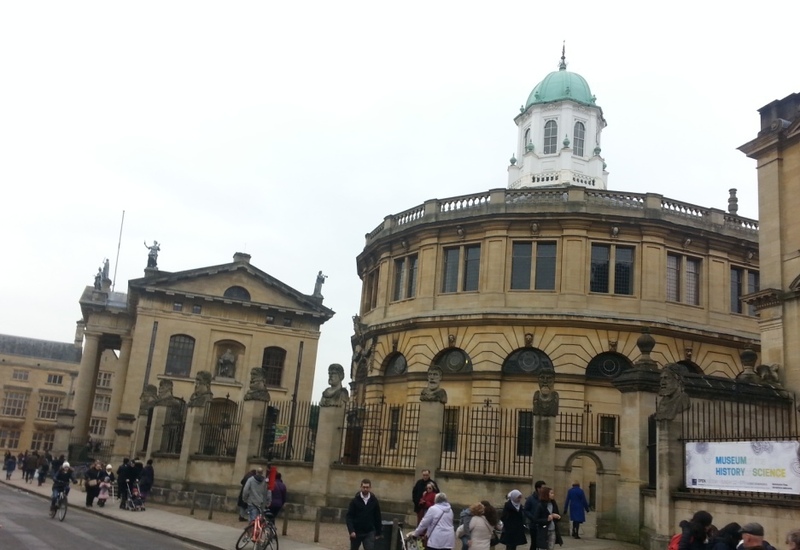 Built between 1664 and 1669 the Sheldonian is the official ceremonial hall of the University. From there it was a small step, through the archway, to the Bodleian Library. Opened to students in 1602 there is an earlier library built in the 15th century incorporated in the building. The Library has had to continue growing with its collection, however, the basic structure of the original buildings remains intact. Because of my longer than expected stay in the Pitt Rivers Museum it was now well into the afternoon and I still hadn't had any lunch. So I staggered past the Radcliffe Camera on my way to a meal break in The Covered Market – established 1774. 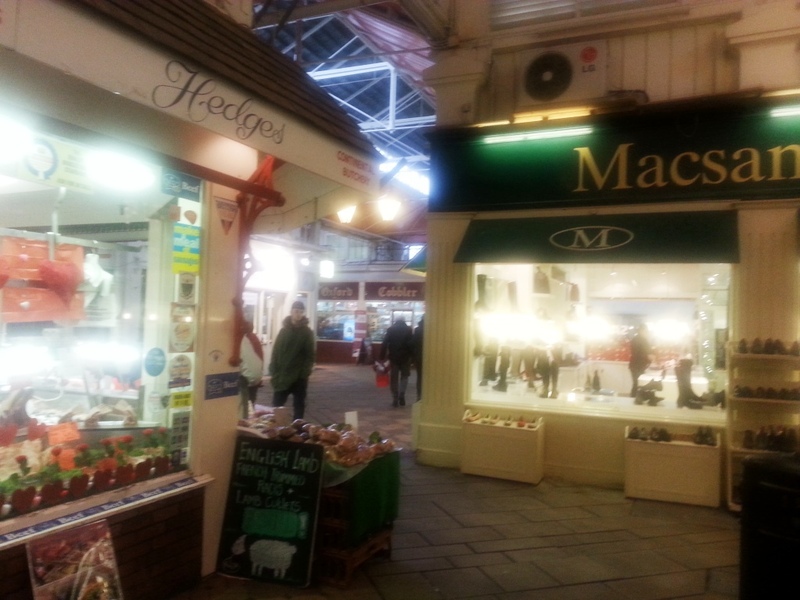 The Covered Market has a huge array of local crafts, food and drink on display in many small and seemingly independent shop fronts. Watered and rested I set off on the last leg of my planned journey and headed for the Oxford Castle Unlocked. At one time it was a castle (naturally) and later on, it was turned into a prison. This attraction is not a museum and has an entry fee of £10.95. To me that seemed a bit steep and, besides, when you've seen the insides of one prison you've seen them all and, believe me, I've seen the insides of a lot of prisons (fear not for my moral turpitude, I once worked for a Department of Corrections). As with all good planning my bus stop was right outside the castle. After a very short wait I caught the bus back to the Park and Ride. All in all, it was a great day. 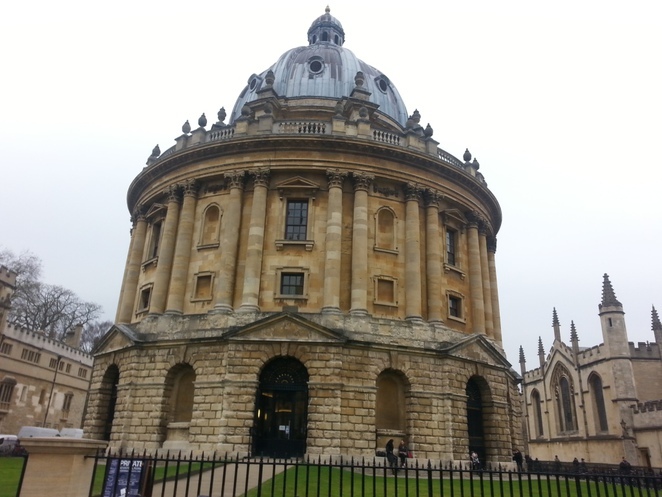 But, this was my day, there are many, many more things to see in Oxford and I would like to have had more time. The one thing I did learn was to make sure you stay on schedule otherwise you end up exhausted trying to make up time. Having said that, there's no way I would have left the Pitt Rivers Museum any sooner. Oxford is nice and flat and the sights are very interesting; all in all a perfect day's walk. Why? A nice, flat walk in the most interesting surroundings you can imagine.